Is it possible to add the date next to the time on the menu bar? I have the time, but no date. Which gives me Mon 29 Aug, 2016. If you use %A and %B It will give Monday and August. I'm not sure what I did to this topic. Anyway, I can get I Orage to install, which is not what I'm looking for. I just want the date next to the time which I just I can't get. Sorry for the forum confusion - I'm not sure what I did. Hi I am not on my main machine tonight. If no one answers and still open I will post tomorrow with screen shots. I'll assume you are using P7 from your profile. Right-click the clock and select "Properties"
I can't believe this is stumping me. I don't see any option in the XFCE Panel or Orage to insert the date. There is a choice to configure the time format. What am I missing? 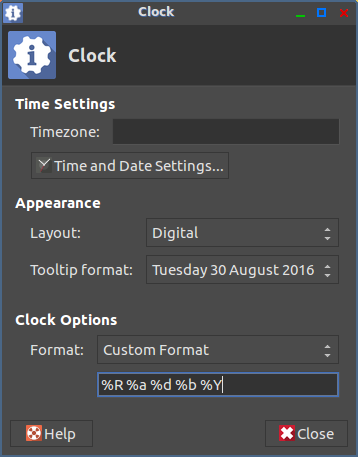 I have used Unity, Gnome 3.20, Cinnamon, Plasma 5 and Budgie with no issue inserting the date to the right of the time.. I just don't see it. Yikes. in the clocks preferences page. No problem, can you please remember to mark the topic solved by appending (SOLVED) to the end of the suject line in the FIRST posting in this topic. It isn't solved. I just noticed my time hasn't changed. Any ideas? Edit: I think it is solved, now, maybe. %a %b %d, %Y %I:%M:%S %p. I am going to hold off marking this solved for an hour. Tried logging out and in again? I think I got it. I will mark it as solved.